MXenes’ reactivity toward water is shown in this experiment where a Ti carbide MXene survives longer in an oxygen-saturated, non-aqueous system, in contrast to the same MXene dispersed in argon-saturated water. Credit: Shuohan Huang. Researchers at Missouri S&T have discovered that two-dimensional (2-D) titanium carbide materials, or MXenes, can react with water with no other oxidizers involved. Their finding may lead to new insights into the unusual chemistry of MXenes and consequently have impacts on MXenes' storage and device manufacturing. MXenes are one of the largest families of 2-D materials. They are a few atom-thick sheets with the structures of transition metal carbides and nitrides and with distinctive properties such as high electrical conductivity combined with their ability to disperse in water. Researchers are excited about their potential use in energy storage and harvesting applications such as batteries, supercapacitors and triboelectric nanogenerators, which convert wasted frictional energy into electricity, according to Dr. Vadym Mochalin, associate professor of chemistry at Missouri S&T. 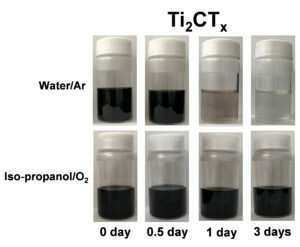 "The reactivity of MXenes toward water we've demonstrated not only changes the common perception about resistance of titanium carbide to hydrolysis in ambient conditions, but also points out the striking differences in chemical properties between bulk and 2-D forms of the same material," says Mochalin. Mochalin and lead author Shuohan Huang, a doctoral student in chemistry working in Mochalin's research group at Missouri S&T, discuss their findings in "Hydrolysis of 2-D Transition–Metal Carbides (MXenes) in Colloidal Solutions," a paper published today in the American Chemical Society journal Inorganic Chemistry. "Our new findings are important because now we know it is water itself rather than oxygen that MXenes need to be protected from during manufacturing and storage," says Huang. "It seems that in their 2-D state, transition metal carbides are quite reactive," says Mochalin. "With our result, we're looking forward to follow-up studies of their rich chemistry in reactions with water and other molecules, including organic compounds, as well as studies into MXenes' possible catalytic properties."